Are Corporate Ad Campaigns ‘Borrowing’ from Artists? Last Saturday, at an event called the Luminosity Art Ball in Lexington, Kentucky, Calgary-based artists Caitlind r.c. Brown and Wayne Garrett unveiled “New Moon,” a sculpture built from more than 5,500 repurposed light bulbs, designed to be manipulated by its audience to cycle through the phases of the moon. The work is the latest piece in an ad hoc series that began with “Cloud,” another enormous array of working, audience-manipulated light bulbs, which was the talk of Calgary’s inaugural Nuit Blanche in the fall of 2012. What made “Cloud” so immediately appealing was the effortless, enchanting way it invited audience participation and collaboration. The light-bulb sculpture, assembled in Calgary’s Olympic Plaza, was mounted at ceiling height with hundreds of dangling chains to pull. You could stand back and consider the object, but the real fun was in stepping beneath it, yanking chains, shaping and reshaping it. “Cloud” changed moment to moment, inviting constant tinkering and impromptu synchronization by its audience. It was also perfectly suited to spread virally on social media. Every audience member saw it differently and experienced it intimately, as something they were not just viewing but participating in. The smartphone pictures and giddy tweets spread like wildfire, and the world at large soon discovered a pair of young artists (Brown is 25, Garrett is 29) who’d already built a reputation in Calgary for wildly inventive and collaboratively bent genius. Acclaim—and new commissions—soon followed. “Cloud” travelled to Moscow and Prague and Eindhoven in the Netherlands. It was a finalist for a Fast Company Innovation by Design Award and it was showered with praise by art and design magazines worldwide. An online video documenting the piece found more than 100,000 viewers in just the first few weeks after “Cloud” debuted at Nuit Blanche. Maybe the most common viral image of the piece was a still photo like this one on the Inhabitat blog, in which dreamy-eyed audience members gaze upward as “Cloud” shines heavenly light down on them. It’s a captivating image, a resonant and instantly recognizable symbol of the joy and power of collaboration. Small wonder, then, that it spread with such zeal. Who knows how many desktops and handheld devices it reached? There’s probably no way to know – which is a key point in the next chapter of the “Cloud” story. Now, the joy and power of collaboration ranks nearly as high as new and improved in the annals of treasured corporate marketing tropes, especially in the breathless messaging around anything even vaguely technological or self-branded as innovative. 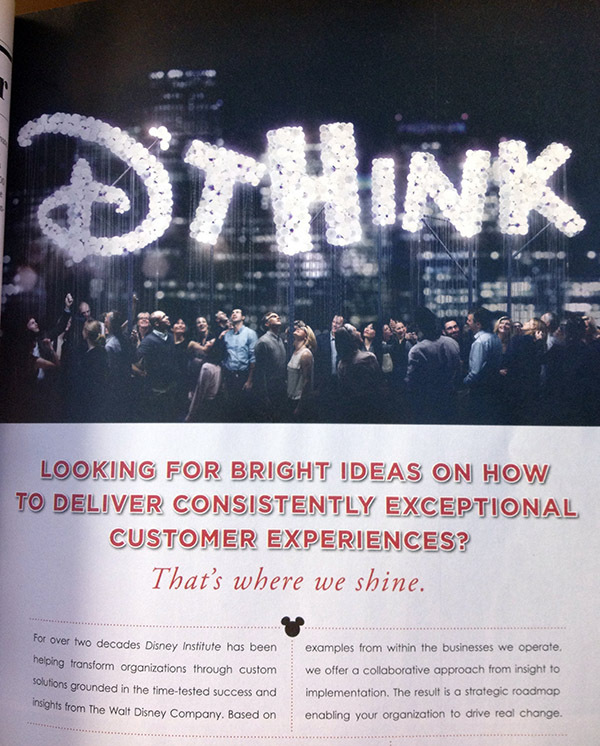 In a full-page ad in the September 2013 issue of Fortune magazine, for example, the Disney Institute pitched its “collaborative approach from insight to implementation” using an image of a cluster of fresh-faced, corporate-casually dressed folks staring skyward at a light-bulb cloud in the shape of the letters “D’THINK.” And for its 2014 digital New Year’s message, IBM commissioned a short film in which a multicultural troop gathers at a wall of dangling pull-cords to illuminate a light-bulb sculpture mounted above in the shape of the company’s “Smarter Planet” logo. As a triptych, Brown and Garrett’s “Cloud” and the IBM and Disney images make for a curious case study in the murky landscape around the proprietary edges of an original artwork, a shadowy world inhabited by terms like “intellectual property” and “remix culture,” collaboration and inspiration, borrowing and infringing. By way of better illumination, I wrote to IBM and the Disney Institute to ask where their light-bulb sculptures had come from. In IBM’s case, a spokesperson wrote back to say that their digital greeting had been produced by the advertising firm Ogilvy and Mather, which used the “Smarter Planet” logo (first employed by IBM in 2008) as its centrepiece. 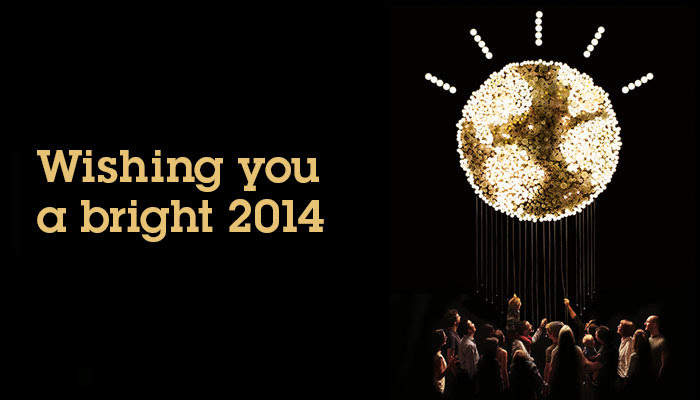 The logo has been rendered in previous season’s greetings as an elaborate origami sculpture animated in stop-motion and as an explosion of fireworks. IBM, I’ve been assured, has been using light bulbs in its advertising as far back as the 1940s. The light-bulb “Smarter Planet” was a flat wall of bulbs assembled in a London studio called Hothouse. The concept involved “digging inspiration from around the world”—the spokesperson listed five nations of origin for the inspiration, none of which was Canada, including “a walk-through, lightbulb sculpture done in 2011 in Madison Square Park.” This last was presumably a reference to artist Jim Campbell’s 2010 installation “Scattered Light,” which was, to my eyes, a great deal less compact and cohesively sculptural than “Cloud” and IBM’s logo. The Disney Institute’s spokesperson, meanwhile, wrote back to say their D’THINK sculpture had been conceived in-house and inserted into a commissioned photograph after the fact, using computer graphics. More specific details about the image could not be divulged “for trademark and proprietary reasons.” I wrote back asking specifically where the concept of a light-bulb sculpture had come from, given its similarities to “a sculpture installation at the Nuit Blanche art festival here in Calgary back in 2012.” The spokesperson has not yet replied. Warhol, of course, painted soup cans—logos and all—without first obtaining expressed written consent of the Campbell Soup Company, and the lines between art and commerce and trademark and copyright have only blurred further and further in the years since. 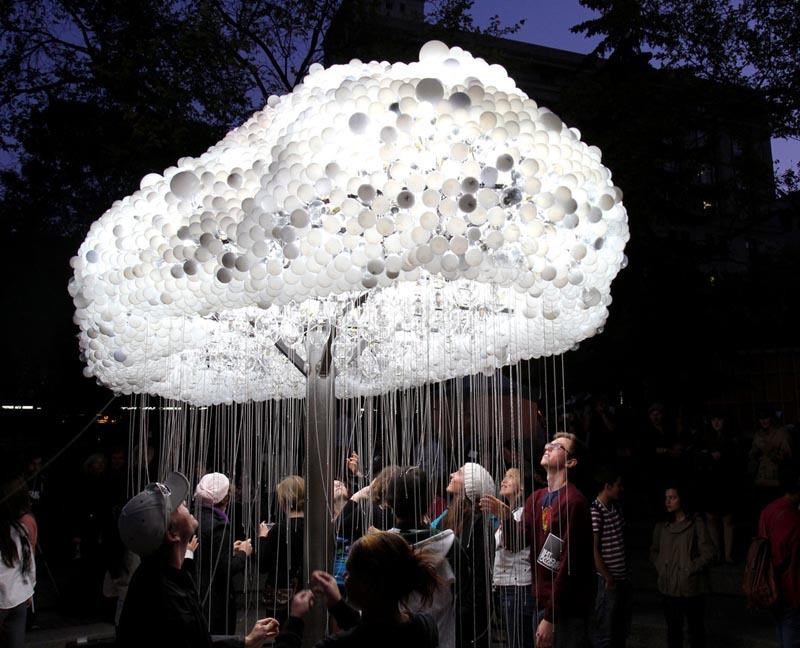 Is a compact, cloud-shaped light-bulb sculpture a proprietary concept? Is it made more so by the interactive element, the hanging cords and upward-turned faces? Can Garrett and Brown even be thought to properly have any rights to images of their piece mid-interaction? Should they be flattered by imitation (conscious or otherwise) or should they call an intellectual property lawyer? Certainly there are precedents. Last year, Houston-based artists Dean Ruck and Don Havel filed suit against Honda and the makers of a commercial depicting a car passing through a house down an exploded tunnel-like passage almost identical to their installation “Inversion.” And artist Janine Gordon sued another artist, Ryan McGinley, claiming many of his photos—including several used in Levi’s ads—were “substantially based” on her work. One of the alleged copyright infringements was a McGinley photo of a woman gazing skyward, mimicking the composition and posture of a figure in a Gordon photo with substantially different context. There would seem to be at least as much similarity between “Cloud” and Disney’s D’THINK sculpture. On the other hand, Disney employs about as many copyright lawyers as the “Cloud” has light bulbs, and as a post at the (US-based) Graphic Arts Guild warns, infringement lawsuits can often be drawn-out, costly affairs. I have to think it’d be tough for Brown and Garrett to get a fair hearing against an opponent so thoroughly lawyered up. And in the meantime, they are free to reinterpret their own work in Kentucky and beyond.